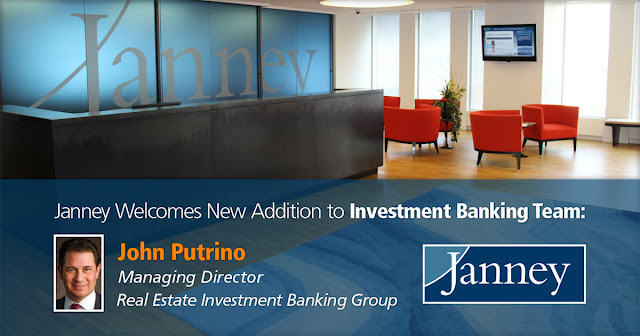 Philadelphia, PA – June 21, 2016 – Janney Montgomery Scott LLC (“Janney”), a leading full-service wealth management, financial services and investment banking firm headquartered in Philadelphia, PA, today announced the addition of John Putrino, who will join as Managing Director in the Real Estate Investment Banking Group. Bringing with him over 19 years of investment banking experience, Mr. Putrino previously served as the CEO of Sachem Street Capital Advisors, an independent financial advisory firm focused on companies and investors in the lodging and leisure sector. Prior to Sachem Street Capital Advisors, he served as Managing Director and Head of North American Lodging & Leisure Investment Banking for BMO Capital Markets, Managing Director for Imperial Capital and Managing Director for Credit Suisse. In his new role, Mr. Putrino will be responsible for directing the investment banking activities within the lodging and leisure sector, providing strategic advisory and financial solutions that drive client results and create shareholder value. Based in Janney’s headquarters in Philadelphia, Mr. Putrino will report directly to Mr. Booth and will play a primary part in building the Real Estate Investment Banking Group within Janney. Mr. Putrino received a Master’s of Public and Private Management from Yale University and a Bachelor’s and Master’s degree in Accounting from Pace University.